Mary Ann Shadd was born in Wilmington, Delaware on October 9, 1823. Her father Abraham was a shoemaker. His father, Mary Ann's grandfather, was the son of a free black woman and a German soldier who served under General Braddock in 1755. There were thirteen children in Mary Ann's family. She was the oldest. When she was ten years old the family moved to Pennsylvania where she attended a Quaker* school. The Shadd home was a stop on the Underground Railroad. * They provided shelter for slaves who were running away to find freedom. Mary Ann was light-colored and being biracial was an asset to her family both socially and financially. After she graduated from the Quaker school she began a teaching career instructing black children. In 1849 she published an essay called "Hints to the Colored People of the North". She then wrote a letter to Frederick Douglass who published the North Star newspaper. She was critical of the black leaders and the black churches. She called for education and action to correct the injustices which were suffered by blacks. The passage of the Fugitive* Slave Act in 1850 was to help slave owners regain control of their runaway slaves. Many slaves lived in fear of being returned to their masters and moved to Canada to get beyond the reach of the law. In 1852 she wrote A Plea for Emigration* or notes on Canada West. Canada had abolished slavery in 1833. Mary Ann took her own advice, moved to Canada, and began to teach there. In 1854 she teamed up with a minister, Samuel Ward, to publish a newspaper caller the Provincial* Freeman. Her purpose of the paper was to support the fugitive slaves and to urge blacks both slave and free to come to Canada where Mary Ann felt they had greater safety and more opportunities to advance. She was the first black woman to edit a newspaper. She wrote in one article that she had "broken the editorial ice". Because Mary Ann's writings were so harsh and abrasive, she made a lot of enemies. She turned the paper over for a while to a minister named William P. Newman. She thought it would prosper better without her leadership. When she was thirty-two years old she married Thomas Cary of Toronto. He was a barber who owned his own business. He had been married before and had three children. Five days after they married she left on a fund raising trip. She would be away from her husband and children for extended periods of time. She moved to Chatham, Ontario which was 180 miles away. Two years later Thomas moved to be with her. She and Thomas had two children, Sarah and Linton. Unfortunately, her husband died shortly before Linton was born, and she was left with a 3-year-old, a newborn, and three teen-agers to raise by herself. 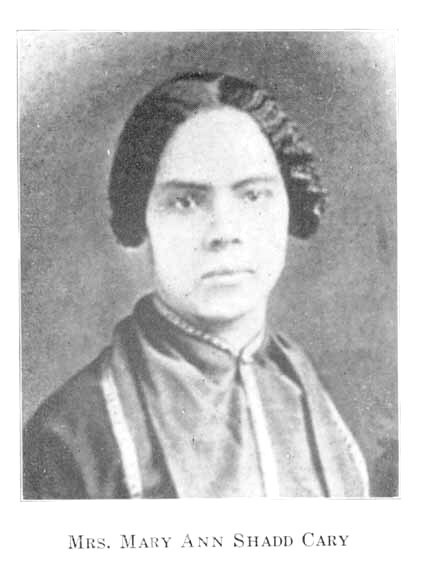 She returned to the United States and became a recruiter of black soldiers for the union army. In 1869, when her youngest child was nine years old, she enrolled in law school at the Washington University. There were 46 students in this first class at the university. In addition to Mary Ann the student body included her 26-year-old brother Abraham. He was twenty years younger than his sister. She went to the university at night and taught school during the day. Cary was held in high regard by Frederick Douglass, and she worked with Susan B. Anthony to obtain the right to vote for women. She died in 1893 after suffering with stomach cancer. Her daughter Sarah was still living. Her son Linton had died the previous year. Her obituary described her as "a woman of excellent traits of character and loved by all who knew her". It goes on to say, "While she may have been excentric* at times, she was a woman of kind disposition." Her daughter Sarah wrote an essay about her which is published in a book called Homespun* Heroines and Other Women of Distinction. This page displayed 57,420 times.